It's been windy and rainy all week, it might snow on Saturday, there are still a gazillion football games that will need a half time snack... and those are reasons enough to cook up a mess of greens. 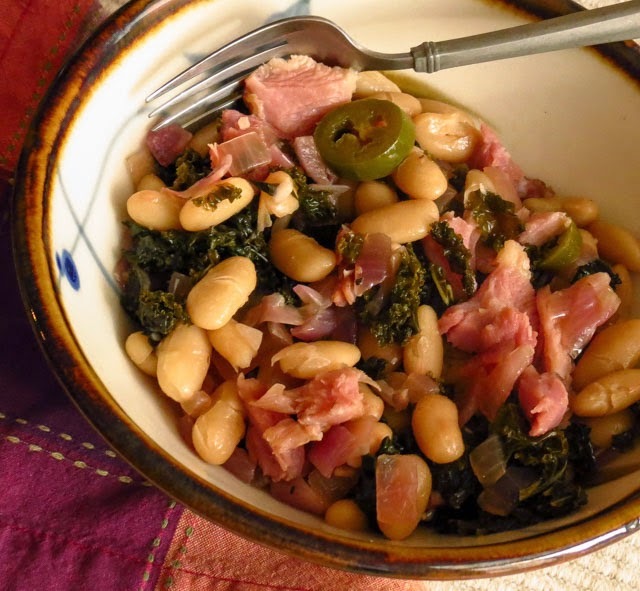 As if I needed an excuse to combine smoked turkey parts, fresh kale and white beans with garlic, jalapeño slices and a splash of red wine vinegar. Those six flavorful ingredients plus a hit of hot sauce came together into an irresistible bowl of comfort food for lunch today. A small portion would be perfect as a side dish, but we went with a large bowl apiece for a filling, one-dish meal. Tomorrow I'll add some chicken broth to the leftovers for a tasty souplike version of the recipe. This dish was inspired by a recent Food Network Thanksgiving special, something I had turned on as background noise to keep me company. It stayed in the background until a preparation for Southern collard greens grabbed my attention. Forget the featured turkey, cornbread dressing and sweet potato something, I craved those smoky greens! Using the Michael Symon recipe as a base, I made a few changes. We prefer kale to collard greens, and I always have some on hand, so that accounted for the first change. A jar of Mezzetta's Tamed Jalapeño Rings substituted for a fresh chili pepper. The dish needed more substance, so a can of cannellini beans joined the party. Green Tabasco sauce added a final pop. Oh, baby, those were some good greens! I have half a dozen other kale posts, all recipes we enjoy, but this is the first kale dish that RL has requested as a repeat. That's a good sign, those must have been some good greens! Roughly chop the kale into 1/2-inch pieces. Wash well under cold water. Drain and set aside. Add a film of olive oil to a large heavy-bottomed Dutch oven; use medium heat and sear the turkey pieces on all sides until crisped, about 5 minutes. Add the onions, garlic and a large pinch of salt; heat until the vegetables are softened and you can smell the garlic, about 3 minutes. Add the rinsed kale, jalapeño rings, vinegar, sugar and 1 to 2 teaspoons salt. Cover and cook until the greens are wilted, 20 to 30 minutes. Add the drained and rinsed beans, stir to combine and cook briefly to heat. (Add some chicken broth if you like your greens soupy.) Remove from the heat and check the seasoning, adding additional salt and vinegar to taste. Remove the turkey pieces and pull the meat off the bones, discarding any large chunks of fat. Shred some of the turkey meat and toss with the cooked greens. Add hot sauce to taste and serve. * Next time double the amount of greens, or use larger bunches of kale, equal to roughly 2 pounds. * Garbanzo (ceci) beans would be a good alternative to cannellini beans, providing more crunch to the dish. baked for the Twelve Loaves November 2014 pumpkin theme. As noted in an earlier post, I don't eat pumpkin, not pumpkin anything. Forget the traditional pumpkin favorites of Thanksgiving pumpkin pie, pumpkin bundt cakes, pumpkin bread, pumpkin lattes... really, I mean it, not pumpkin anything. 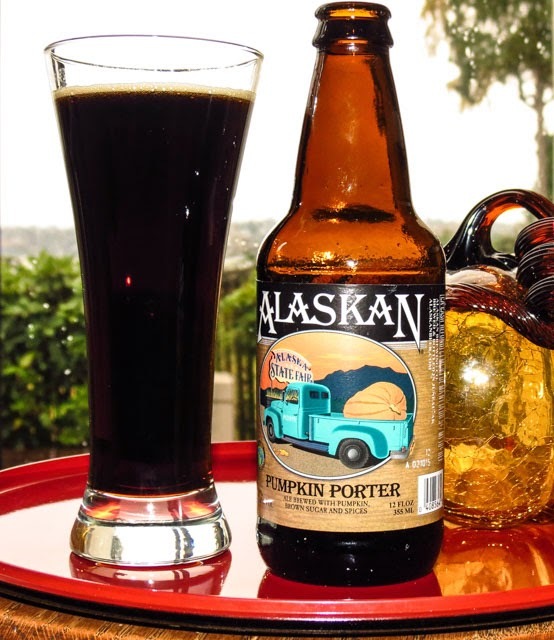 Match that with my love of a challenge and my frugal nature and you can imagine the issue when I found one last bottle of Alaskan Pumpkin Porter hanging out on a garage shelf. I couldn't throw it out. Left over from an earlier Autumn event that bottle sat ignored and gathering dust amidst newly purchased beverages. Though guests reported the brew to be quite tasty, I just couldn't get past the ingredient list of "ale brewed with pumpkin, brown sugar and spices". Today I finally popped the top and poured a glass for a taste test. Surprise! The first exploratory sip was fairly pleasant; this was a dark, chewy porter with some flavor muscle and a hint of sweet, undefinable something, a something not pumpkin. Fine, but at 9:20 a.m. what else could I do with the brew besides drink it? Use it in soup or a stew? Bake beer batter brownies? Braise some pulled pork? 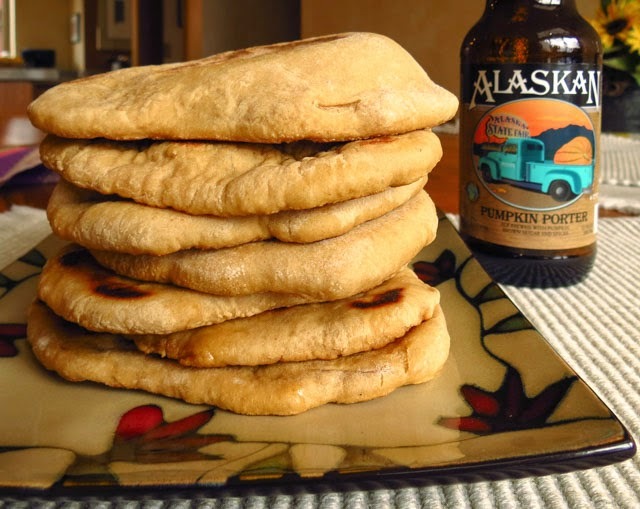 The Beeroness came to the rescue with her recipe for Homemade Beer Pita Bread, a quick yeast bread that reminded me of this month's #TwelveLoaves baking theme - Pumpkin. My KitchenAid made short work of mixing the few ingredients and cranking out the requisite minutes of kneading. The dough ball doubled in under an hour in my 67 degree F kitchen, no surprise since a full package of yeast (2 1/4 teaspoons) was working away on 2 1/4 cups of flour. 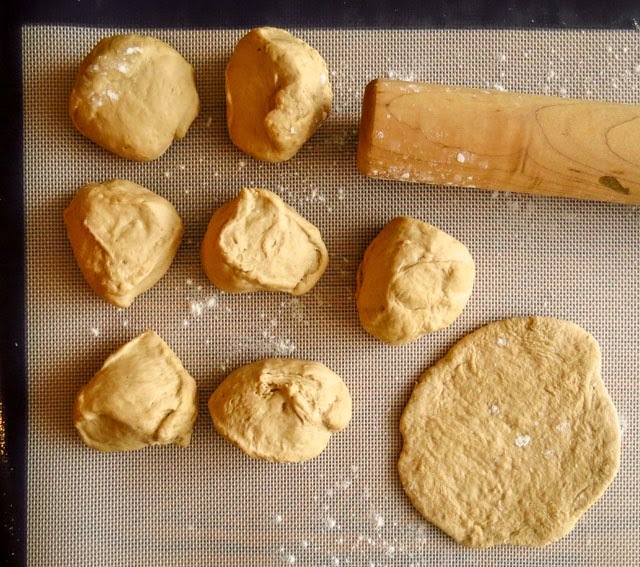 Divided into eight pieces, the dough rolled easily into six-inch disks - how easy could it be?! 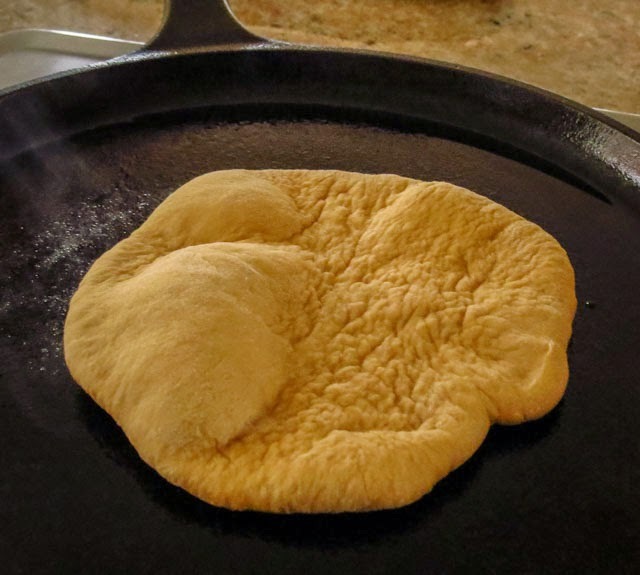 Each Pita round cooked in mere minutes in a cast iron skillet on the stovetop and bubbles appeared like magic. I'd make a double batch next time just for the fun of watching those gas bubbles puff up and expand. I eagerly tore apart the first pita, checking first for easy separation of top and bottom. Success! Next came a tentative nibble, taste testing for any pumpkin flavor. Nope, not even a hint of the dreaded pumpkin taste, just a pleasant, semi-sour tang. Finally I added a slather of butter and a sprinkle of sea salt to the still warm pita and finished it off, quite pleased with the non-pumpkin tasting Pumpkin Porter Pitas. They made terrific lunch sandwich containers, firmly chewy and holding together up to the last bite. Would this be pumpkiny enough to qualify for the November #twelveloaves baking challenge? More pumpkiny than my pepita-topped sourdough dinner rolls (link)? Maybe... we'll see what that group of inspired bakers thinks (if anyone leaves a comment). Use a stand mixer with a dough hook; add the flour, yeast and pumpkin spice (if using) and mix until combined. 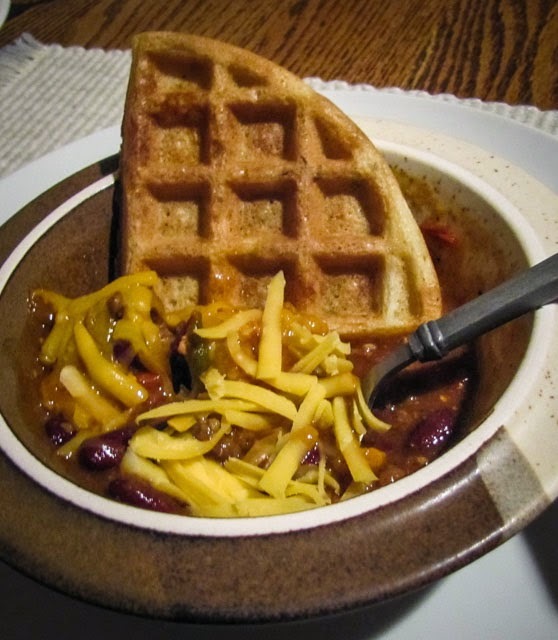 Pour the beer into a microwave safe measuring cup or bowl. Microwave for 30 seconds; use a cooking thermometer to check the temperature; nuke in short burst until the beer just reaches 120 to 125 degrees F. No higher or you might kill the yeast. Add the warmed beer to the stand mixer; use medium speed and mix to combine. Add the salt while the mixer is running. Bump the speed to high and beat until the dough is well-kneaded, smooth and pliable, about 5 to 8 minutes. Remove dough to a lightly oiled bowl, cover and let sit in a warm space until doubled in size. This might take up to an hour. When doubled, place dough on a lightly floured surface and knead briefly. Use a bench scraper and cut into 8 equal pieces. Roll a piece of dough into a 6-inch circle. One at a time repeat with the remaining pieces. Use a small cast iron skillet; lightly oil and heat over medium-high heat. Add one rolled dough circle to the pan and cook until the bottom is lightly browned and air bubbles pop the top in places, 1 to 2 minutes. Flip and cook the other side for another 1 to 2 minutes to cook the pita through. Note: If the pita browns too quickly, threatening to burn, turn the heat down or use a flame tamer (heat diffuser) to adjust the heat. #TwelveLoaves is a monthly bread baking party created by Lora from Cake Duchess and run with the help of Heather of girlichef, which runs smoothly with the help of our bakers. Our host this month is Renee from Kudos Kitchen by Renee, and our theme is Pumpkin. For more bread recipes, visit the #TwelveLoaves Pinterest board, or check out last month’s tempting selection of #TwelveLoaves Apple Breads! 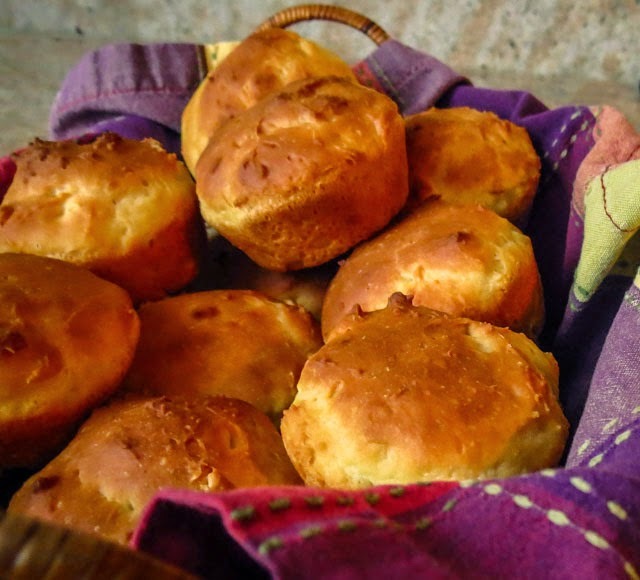 Last winter I played with several Quick Dinner Roll recipes, searching for one that might produce rolls to rival those of my mother-in-law. None matched the memory of Irene's light and airy rolls, so I'm still hunting for the perfect recipe. 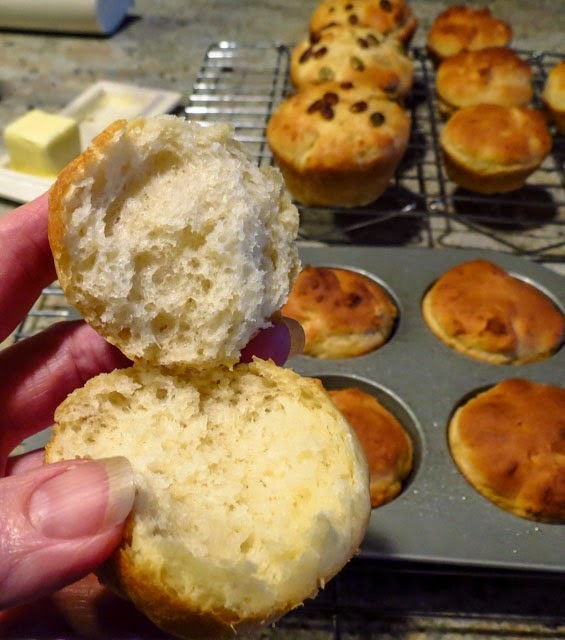 This month SourdoughSurprises chose dinner rolls as their baking challenge, providing me a welcome opportunity to check out successful recipes from other bakers as they post their results on individual blogs and on Pinterest. This group always produces amazing sourdough treasures. Recent surgery has slowed down my culinary efforts lately, but it's time to get busy baking and cooking again. Soup has been a menu staple this month, helping to combat November's chilly weather, and nothing goes better with homemade soup than homemade rolls. Just the aroma of freshly baked bread adds warmth to the kitchen as well as smiles to my day. 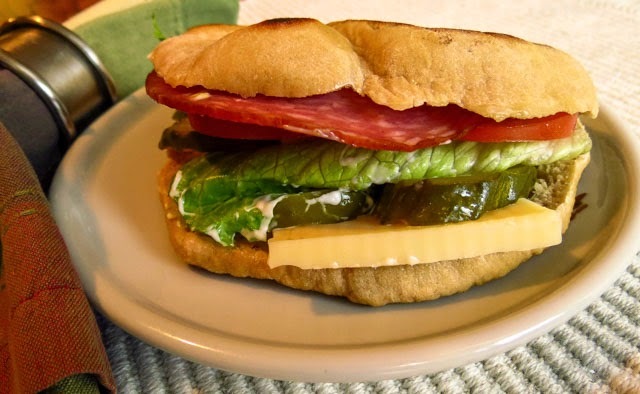 That said, I wasn't ready to attack heavy-duty kneading while still on crutches, so I returned to the search for a quick and easy dinner roll recipe, something I could do while seated. Rather than create a real 100% sourdough dinner roll, I added sourdough starter to an adapted version of Double-Quick Dinner Rolls found in a 1961 edition of Betty Crocker's New Picture Cook Book. Quick but not exactly "double-quick", the recipe did come together easily and produced buns that were quite acceptable. Though still not as tender and light as Irene's, these rolls were a definite improvement over my previous attempts. Perfect Quick Dinner Rolls are still a work in progress in my galley. Do you have a favorite recipe to recommend? Add the water and buttermilk to a large mixing bowl; sprinkle the yeast over the top and stir to dissolve. Add the sugar and sourdough starter and whisk until smooth. Sift the flour or measure with a scoop-level-pour method. Add half of the flour and the salt to the yeast mixture and beat until smooth. Add the egg and butter; beat in the rest of the flour until smooth. Scrape down the sides of the bowl, cover with a cloth and let rise in a warm place until double (about 40 minutes in my oven set for bread proofing, 100 degrees F). Grease large muffin cups. Stir down the raised dough and scoop or spoon into the muffin cups, filling them about half full. Let rise in a warm place until the dough reaches the tops of the muffin cups. *Optional: sprinkle seasoned pepitas over the tops of each roll before the second rise. Heat the oven to 400 degrees F. Bake on a center rack until lightly golden, 15 to 20 minutes. *Optional: brush the tops of the still-warm rolls with melted garlic butter for a flavor pop. Note: #TwelveLoaves bakers chose pumpkin as their November challenge. 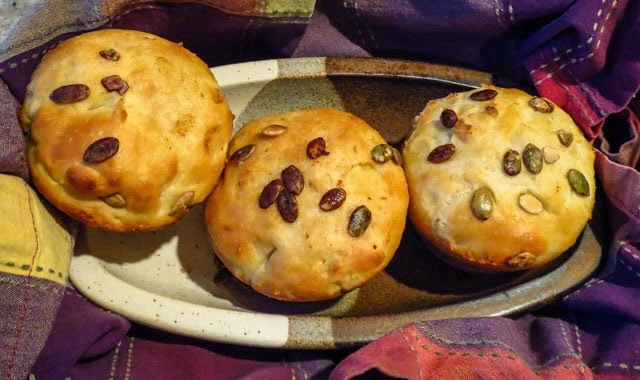 A sprinkling of pepitas might qualify these dinner rolls as fitting their monthly theme, or maybe not. I don't eat pumpkin-flavored anything so these buns are as close as I'll come to baking with #TwelveLoaves this month. If you are a pumpkin fan, you'll want to check out their bread recipes for November. #TwelveLoaves is a monthly bread baking party created by Lora from Cake Duchess and run with the help of Heather of girlichef, which runs smoothly with the help of our bakers.Our host this month is Renee from Kudos Kitchen by Renee, and our theme is Pumpkin. For more bread recipes, visit the #TwelveLoaves Pinterest board, or check out last month’s tempting selection of #TwelveLoaves Apple Breads! My first post-operation foray into kitchen action included a predawn raid on the baking cabinet. After weeks of healthy eating (fruits, vegetables and protein) my sweet tooth kicked in. Lucky for me that my recipe for buttery shortbread squares takes few ingredients, avoids any fancy rolling pin work, and can be made quickly - even by a cook on crutches. 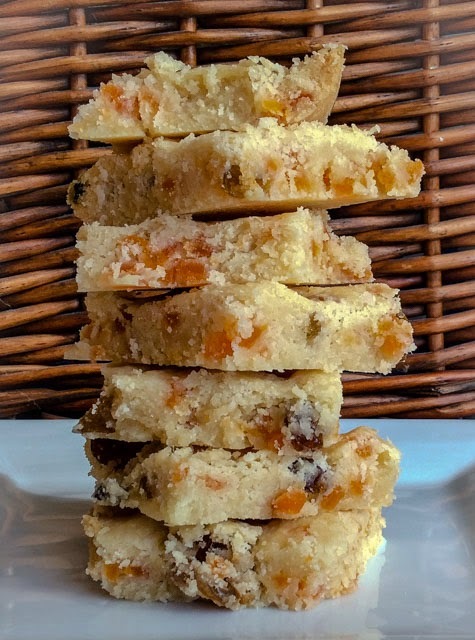 My previous shortbread squares have relied on citrus zest for a flavor pop, but this time substituting freshly grated ginger made for a pleasant alternative. Dried mango slices, still pliable and faintly moist, paired well with the ginger, adding a subtle tropical note. The golden raisins just came along for the ride it seems. I might toss in a bit of shredded, sweetened coconut next time for more Island flavor. The result? flavorful, buttery, crumbly shortbread squares were a fine batch of celebration cookies for my first kitchen adventure in a month. Preheat the oven to 350 F. Melt the butter in a medium-sized saucepan over medium heat, or use a glass 8-cup measuring cup and melt the butter in the microwave. Remove from the heat and stir in the ginger, dried mango and powdered sugar. Mix well with a wooden spoon. Stir in the flour and mix until incorporated. The dough will be stiff and crumbly. Use a spatula or your fingers to spread the dough into an ungreased 8-inch square baking pan; pat it down firmly. Bake on a middle shelf 20-25 minutes, until golden on top and lightly browned and firm at the edges. Resist the temptation to overbake. Cool the pan on a baking rack for several minutes and then use a sharp knife to cut the shortbread into 16 equal-sized squares. Do not remove the squares yet, they will crumble and fall apart. Let them cool in the pan for at least 10 minutes, then use a narrow spatula to remove them carefully. We tend to devour them immediately, but you can store the squares, tightly covered, for several days. Freeze for up to 1 month. On the Move... nope, not so much lately. It has been a while since I've been active in the kitchen, and I have missed the action. 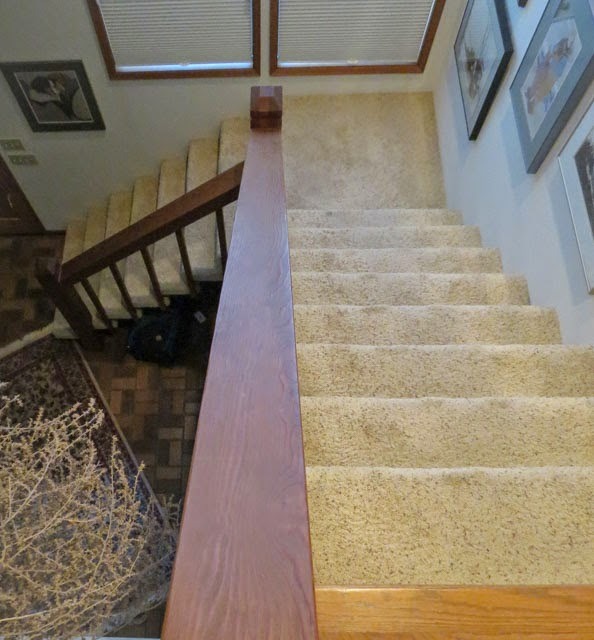 Well, that's about to change as I become more mobile, ready to challenge the 17-step vertical journey between bedroom and kitchen more often and still have enough energy left to slice and dice, stir and toss, etc. Soon! Last month I planned ahead and stocked the freezer with some easy-to-reheat items for RL to prepare as he assumed butler duties. Fruit with a toasted wedge of sourdough waffle or a microwaved frittata muffin has been a perfect way to launch each day, giving me plenty of energy to attack physical therapy and an ambitious exercise program. My appetite remains light, often a salad or baked potato is more than filling for a meal, but a quick, reheated cup of soup has been a welcome, warming treat on these cold Autumn days. I do appreciate having a freezer stocked with some of our favorites. This week I have begun to mess about a bit in the kitchen, roasting a chicken (which took no effort save for teetering around on crutches) and then building a few chicken sandwiches and loaded green salads. Just kitchen puttering, nothing special and no photos, but it took all of my energy for the moment. AmazonFresh has brought groceries to our door, delivering impeccably fresh fruits and vegetables as well as the above-mentioned bird and some basic kitchen staples. I could almost get used to being pampered with delivery service and a live-in butler... almost. But I miss my independence, the action of everyday life, and am SO ready to be mobile again! 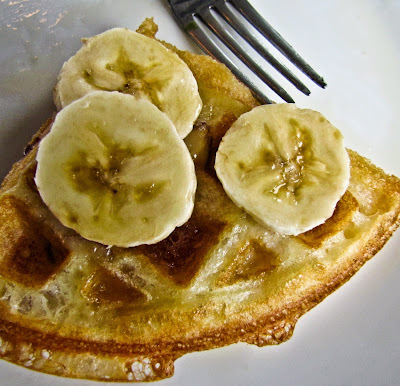 Tons of online food photos and recipes tempt me daily, so watch out! I'll be On the Move-in the Galley any day now.